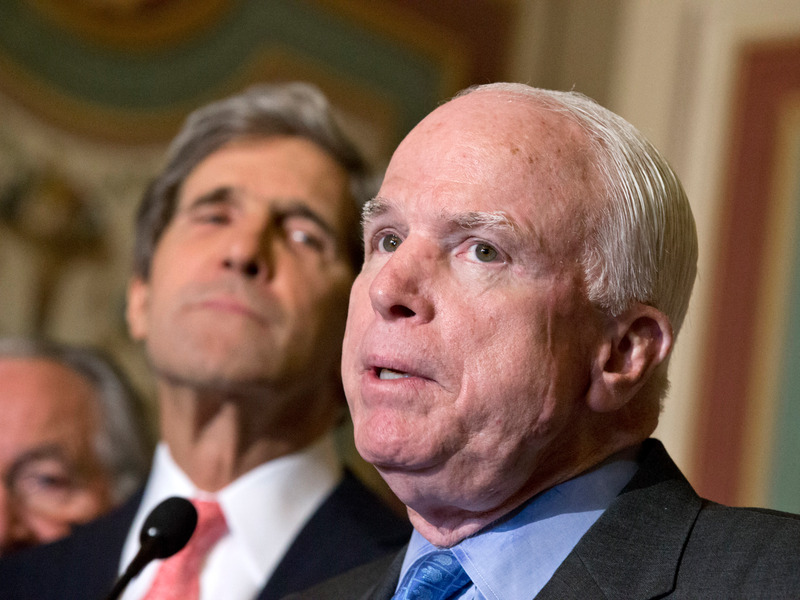 McCain’s opposition puts the bill on the brink of defeat. Maine Sen. Susan Collins, a fellow Republican, said Friday she was leaning against voting for it. Republican Sen. Rand Paul of Kentucky has come out strongly against the legislation. Republicans can only afford two defections for the legislation to pass. McCain also pointed to the lack of clarity surrounding future impacts of the bill if it were to become law. The nonpartisan Congressional Budget Office announced they would not be able to provide a full estimate of the bill’s impact by the September 30 deadline in which the GOP would try to bypass the Senate’s 60-vote threshold. The longtime Arizona lawmaker also said he believes Sens. Bill Cassidy and Linsdey Graham were making a genuine attempt to fix what he believes is a broken healthcare system, but the process by which it was being conducted was not in accordance with how the upper chamber should operate. “I hope that in the months ahead, we can join with colleagues on both sides of the aisle to arrive at a compromise solution that is acceptable to most of us, and serves the interests of Americans as best we can,” McCain said. Not even a week after Sen. John McCain (R-Ariz.) announced he was diagnosed with a particularly brutal form of brain cancer, he stood on the Senate floor in Washington, all 99 senators and the vice president at his attention, and delivered an indictment of the modern era’s hyper-politicized environment, Republicans’ secretive health-care process and a wishful look back at the way things used to be. It was an emotional, no-holds barred moment that came right after the Senate voted 50-50 to debate a health-care vote, requiring Vice President Pence to break the tie. We’ve posted his remarks, as prepared, below and annotated it using Genius. Click on the highlighted text to read the annotations. 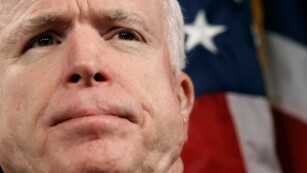 The senator underwent surgery to remove a blood clot on Friday at Mayo Clinic Hospital in Phoenix. Lab results from that surgery confirmed the presence of brain cancer associated with the blood clot. Glioblastoma is a particularly aggressive tumor that forms in the tissue of the brain and spinal cord, according to the American Brain Tumor Association. A pathologist was in the operating room during the procedure, a minimally invasive craniotomy with an eyebrow incision, said his doctor, who added that the surgery lasted about three to four hours. Post-surgical brain scans show the tissue causing concern has been completely removed. McCain is recovering “amazingly well,” according to a statement from his office. The senator showed no neurological problems before or after the operation, said his doctors. Though not identified by name, at McCain’s request, his doctors were given permission to speak with Gupta, who is also a practicing neurosurgeon. McCain is now recovering at his Arizona home. He and his family are considering treatment options, which will likely include radiation and chemotherapy, his doctors said. Doctors discovered the clot during a routine physical exam last week. They said he is very diligent about coming in for scheduled exams and is seen every four months for skin checks due to his history of skin cancer. He arrived at his early morning appointment, Friday before 8 a.m. and as per usual, looked good, according to a doctor who has been involved in his care for nearly a decade. McCain, described as not being a complainer, did report feeling fatigued, which he attributed to a rigorous travel schedule. He also told his doctor he had, at times, felt foggy and not as sharp as he typically is. In addition, he reported having intermittent double vision. These symptoms and doctor intuition prompted a CT scan. When the results came back, McCain, who had already left the clinic, was asked to return for an MRI. Before the operation, his neurological exam was normal, according to his doctor. The operation began in the late afternoon and the senator was recovering in the ICU by evening. His doctors told Gupta they were amazed at how sharp McCain was when he awoke. He knew what year it was and started cracking jokes. He also made it clear that he wanted to leave the hospital and get back to work, his doctors said. Showing no signs of cognitive delays, McCain was discharged Saturday and has been recovering at his home since then. His doctors would not reveal details but said his post operative care is standard. His doctor said McCain was oriented, with good balance and no headaches or seizures. The clot was over the senator’s left eye, not far from the left temple where he was diagnosed with melanoma in 2000. 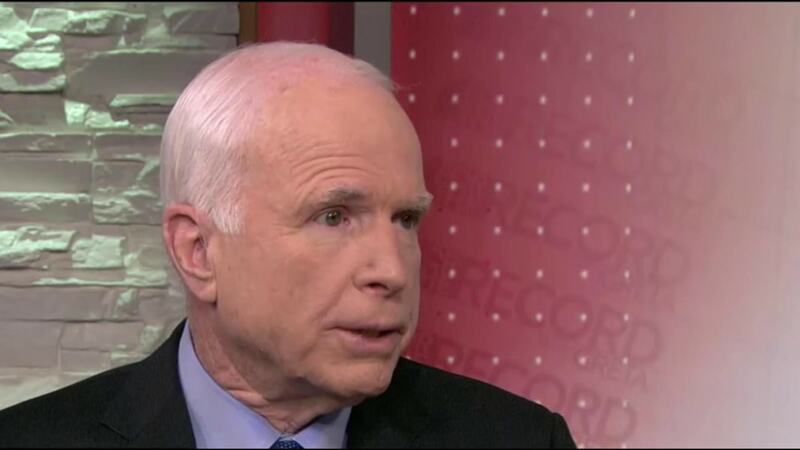 Previously, McCain had three other malignant melanomas removed in 1993, 2000 and 2002. None of these melanomas were invasive. All were declared Stage 0. However, McCain has been regularly screened by his doctors since 2000. Gupta was one of a select group of reporters who reviewed McCain’s medical records in 2008 when he was campaigning for president. The surgical procedure McCain underwent is “a significant operation,” said Gupta, explaining that a bone underneath the eyebrow had to be removed to do the procedure and then later put back. “It’s a very aggressive tumor,” said Gupta. He explained that average survival for malignant glioblastoma tends to be around 14 months with treatment. In McCain’s case, additional therapy, including radiation, could not begin until the incision heals, which would be in the next three or four weeks. Still, one 2009 study reported that almost 10% of patients with glioblastoma may live five years or longer, according to the American Brain Tumor Association. “This is the same tumor that Ted Kennedy had,” said Gupta. Debra Goldschmidt and Dan Berman contributed to this story. 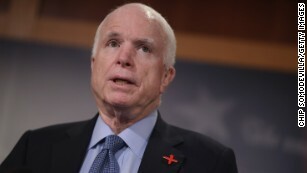 Washington (CNN) Diana Orrock, the Republican national committeewoman for Nevada, shared an article on Monday calling for the death of Sen. John McCain for his hawkish foreign policy views. CNN reached out to Orrock, who said she was not a “big fan” of McCain’s approach to foreign policy. However, she denied actually wanting McCain to die and claimed she was agreeing with the “sentiments” of the article. 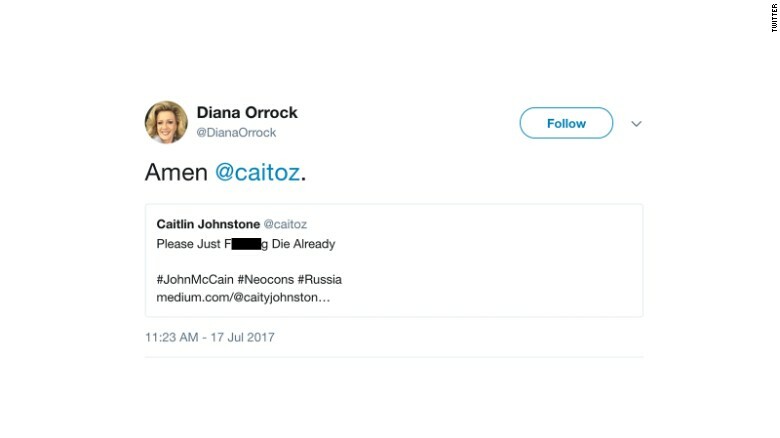 Nevertheless, Orrock repeated she did not want McCain to die, but rather that he just not be in the Senate, and said it would be reaching to say otherwise about her. “People are going to read things into things,” Orrock said of her sharing the article calling for the senator’s death. McCain’s office announced Saturday that he was recovering from surgery to remove a blood clot from above his left eye. Senate Majority Leader Mitch McConnell said Saturday evening that he would delay a vote on the Senate Republican health care bill until McCain returned to Washington. WASHINGTON — The top Democrat on the House Intelligence Committee claimed Wednesday evening that he has seen “more than circumstantial evidence” that associates of President Donald Trump colluded with Russia while the Kremlin attempted to interfere with the 2016 presidential election. 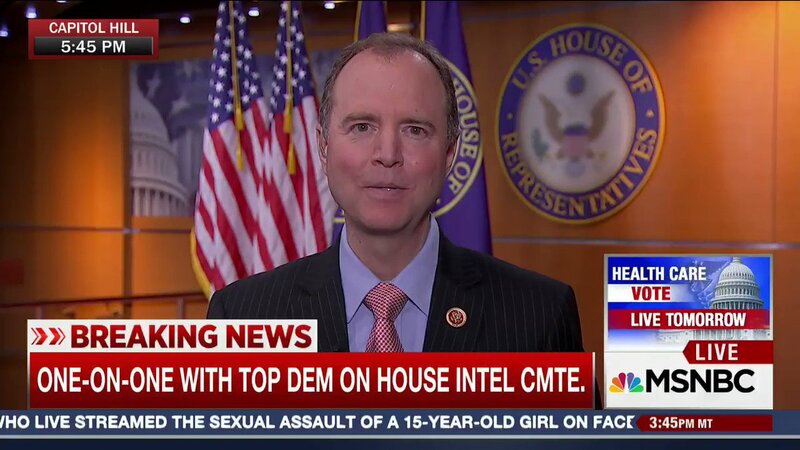 Rep. Adam Schiff, D-Calif., the Ranking Member on the committee, was asked by Chuck Todd on “Meet The Press Daily” whether or not he only has a circumstantial case. That is a shift from Sunday’s “Meet the Press” interview, when Schiff only went as far as to say that there was circumstantial evidence of collusion and “direct evidence” of deception. The Trump campaign and the White House have repeatedly denied that Trump’s associates were at all connected to any activities related to Russia’s attempts to influence the last election. Schiff’s comments came after Republican committee chair Devin Nunes said that he had seen reports from the U.S. intelligence community showing communication from members of the transition team — and possibly the president himself — were “incidentally collected” as part of a broader surveillance effort. Nunes said it appeared most of the information was collected after the election and during the transition, it appears it was collected legally, and none of it was related to Russia or the investigation into Russia. He said he did not know who ordered the alleged surveillance. The disclosure drew condemnation from some Democrats. Schiff bristled at the fact that Nunes did not share the information with him before updating reporters and the White House. “The chairman will need to decide whether he is the chairman of an independent investigation into conduct, which includes allegations of potential coordination between the Trump campaign and the Russians, or he’s going to act as a surrogate of the White House. 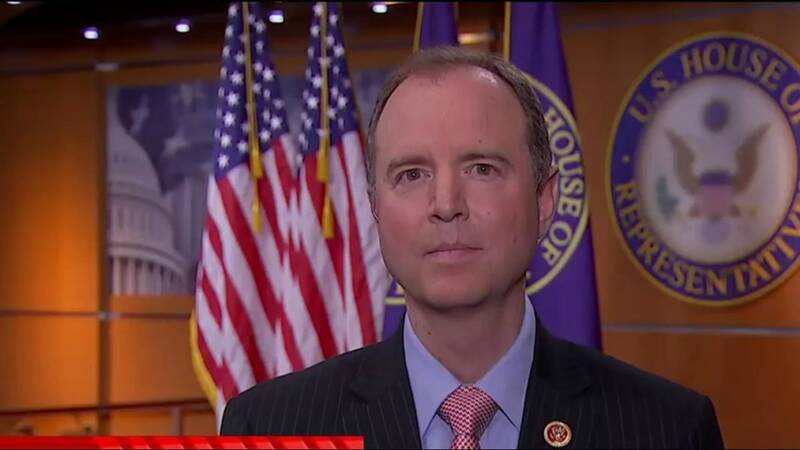 Because he cannot do both,” Schiff said. “From what I know right now it looks like incidental collection, we don’t know exactly how that was picked up, but we’re are trying to get to the bottom of it,” Nunes said. Trump said he felt somewhat vindicated by Nunes’ disclosure: “I somewhat do. I very much appreciated the fact that they found what they found,” the president said. 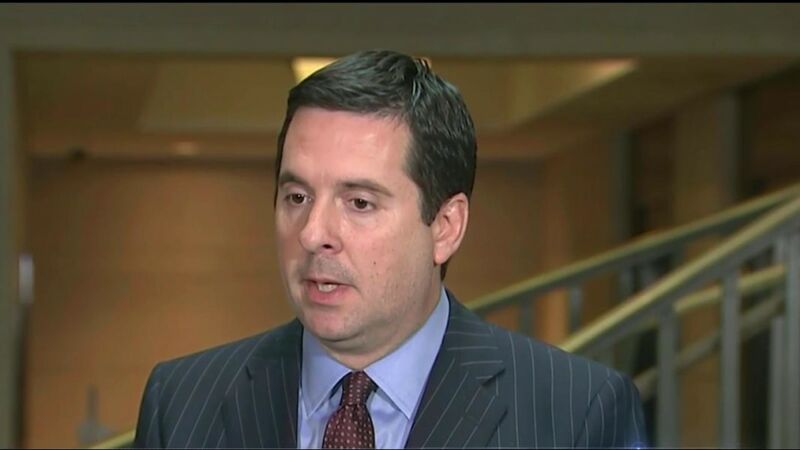 Nunes said he has not seen any evidence that former President Barack Obama had Trump’s “wires tapped” before the election — a claim Trump made on Twitter. The director of the FBI said Monday he has no evidence backing up the tweeted claim. Republican Sen. John McCain, R-Arizona, told MSNBC’s Greta Van Susteren that the back-and-forth among the top members of the committee was “bizarre” and he said partisan fighting had cost Congress its credibility to investigate Russian interference the election. “No longer does the Congress have credibility to handle this alone, and I don’t say that lightly,” McCain, the chairman of the Senate Armed Services Committee, said. On Monday, FBI Director James Comey confirmed that an investigation into the Trump campaign’s ties to Russia had been ongoing since July. Comey said the probe was included in the agency’s investigation into what the U.S. intelligence community concluded was an attempt by Russia to interfere with the 2016 election with the purpose of helping Trump win. The House and Senate Intelligence Committees are conducting their own investigations. Two weeks ago on “Meet The Press,” James Clapper, the former Director of National Intelligence under President Obama, said that to his knowledge, there was no evidence of collusion between Moscow and Trump associates. Clapper oversaw the work of U.S. intelligence agencies through January 20th. Donald Trump Is Using 23 Million People In Taiwan As A Trade Bargaining Ploy With China? with Taipei in 1979, yet is treaty-obliged to sell the island the weapons it uses to protect itself from Beijing. One can have sympathy for Donald Trump not wanting to partake in such a charade, which is commonly known as the “One China” principle. The U.S. President-elect had the backing of many people in Taiwan when on Dec. 2 he accepted a phone call from its President, Tsai Ing-wen. Owing to “One China,” which was negotiated by an earlier KMT government in Taiwan, it was the first direct contact between the leaders of Taiwan and the U.S for almost four decades. When Beijing cried foul, Trump sent a series of unrepentant tweets, culminating with an interview on Fox on Sunday during which he said “One China” was up for negotiation and dependent on what Beijing does for the U.S. in return. 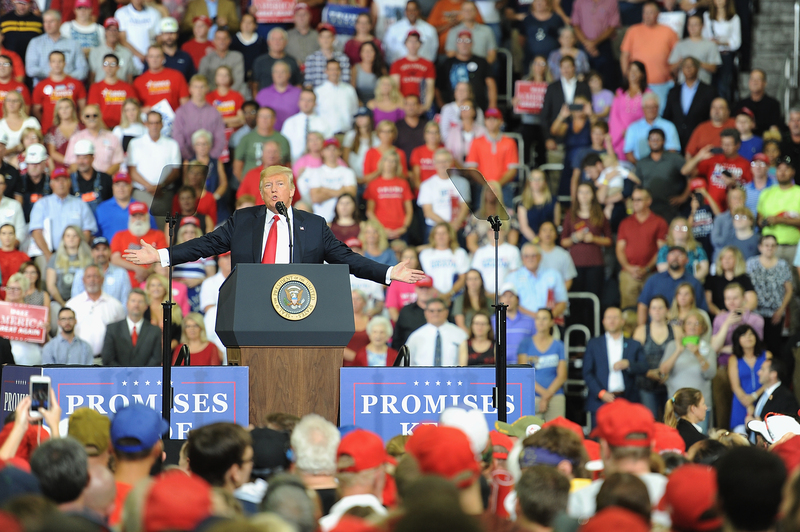 “Trump’s taking a more realpolitik approach, saying there are no sacred cows, we won’t be pushed around and everything is on the table,” says Prof. Nick Bisley, an Asia expert at Australia’s La Trobe University. Trump went where no U.S. commander-in-chief had gone since diplomatic relations were restored with China in 1979 — by speaking directly to the President of Taiwan, the island-state of 23 million that is essentially an independent country. Taiwan would bear the brunt of a metastasizing Sino-U.S. relationship, though Trump has never mentioned what the island’s citizens desire during his bating of the Chinese leadership. Instead, the President-elect has treated the case like a business deal, jostling for the smallest advantage, while needling the world’s second largest economy over trade tariffs and alleged currency manipulation. “Trump is trying to get some more bargaining chips to use later with Beijing,” adds Tang. “Taiwan is just a leverage point for Trump.” And Trump’s actions elsewhere are recasting the rules of the game and further imperiling the island’s people. The other headline of Trump’s nascent foreign policy is warming ties with Russia. Trump repeatedly praised President Vladmir Putin during his presidential campaign, flying in the face of the international condemnation prompted by Moscow’s 2014 annexing of the Crimea, not to mention its steadfast support for Syrian President Bashar Assad. On Wednesday, Trump named his candidate for Secretary of State: Rex Tillerson, the ExxonMobil chief with a long history of deals with the Kremlin, and who was awarded the Russian Order of Friendship in 2013. The nod raised eyebrows even within Trump’s own party. Chinese President Xi Jinping’s seminal One Belt, One Road economic strategy — a rekindling of the iconic land and maritime Silk Road though infrastructure and development projects — is dependent on rosy relations with Russia and particularly Central Asia, which is largely beholden to the Kremlin. Today, Russia is the world’s top oil exporter — accounting for 70% of all national exports — and its top customer is China, which bought 22 million tons in the first half of this year. Squabbles over disputed territory in Central Asia have been solved with surprising prudence and a raft of pipeline and other infrastructure deals have been struck. “Relations are robust and I can only see them getting stronger,” says Trenin. By contrast, the U.S. has little to offer Russia. But Trump’s fawning of Putin does have an effect. Trump announced Tillerson’s appointment just as Assad’s Russian-backed troops retook Aleppo, displacing thousands and reportedly slaughtering scores of innocents. But Beijing is most acutely aware that the Kremlin suffered few repercussion from its seizing of Crimea, other than economic sanctions it shrugged aside (and Trump could soon lift them at a stoke of his pen.) If Trump wants to put ethics aside and talk realpolitik: What would the U.S. do if China decided to retake Taiwan? To rephrase: What could it do? The U.S. military is stronger that China’s overall, though a war in China’s coastal waters would be bloody and impossible to win. The Philippines, traditionally America’s staunchest ally, has become antagonistic with Washington and chummy with China since new President Rodrigo Duterte took office. There are also resurgent calls to removed U.S. troops from bases in South Korea and Japan, who both list China as their largest trading partners. Beijing has built islands — dubbed unsinkable aircraft carriers — in the South China Sea, which new satellite images indicate contain significant weaponry. Not to forget that Trump campaigned on drawing down commitments on costly wars overseas. Trump thinks he is being clever by shaking up the status quo in East Asia, but there is a reason why all six preceding U.S. Presidents have firmly stuck to the convenient fiction of “One China.” In a game of true realpolitik when everything is on the table, China knows exactly what it wants — and it also now knows what it can probably get away with.